rob law MBE motivational speaker from Rob Law on Vimeo. Since Trunki launched in May 2006, the company has sold 3.5 million suitcases in over 100 countries with consumers spending over $200 million on his brand. Trunki employs 30 people at their funky head office in Bristol called The Mothership, and a further 50 people at its UK manufacturing and distribution facility - Magma Moulding - in Plymouth. On New Year’s Day 2011, Law was awarded an MBE for Services to Business, and went on to receive an honorary degree of Doctor of Engineering from Bath University in 2015 and this summer will receive a Honorary Doctor of Business Administration from UWE. Law is a popular and engaging personality on the speaking circuit, not least for his ‘dragon slaying’ tips, his fresh take on running a business and how to navigate the ever evolving challenges in the global marketplace, sharing insights at large business conferences to blue chip management teams. When not designing tomorrow’s must have on-the-go products, Law enjoys spending time with his young family and is an amateur triathlete, often found cycling around his adopted home of Bristol. 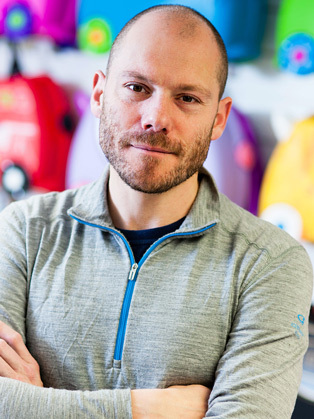 Rob‘s ‘warts and all’ story about how he took Trunki from idea to a global travel brand for children is very compelling and I would highly recommend him as a speaker. He is authentic, engaging and entertaining and had the audience eating out of his hands.